Although dried figs are available throughout the year, there is nothing like the unique taste and texture of fresh figs. They are lusciously sweet with a texture that combines the chewiness of their flesh, the smoothness of their skin, and the crunchiness of their seeds. 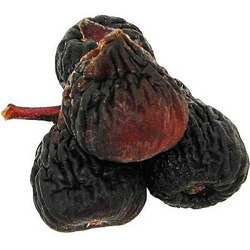 California figs are available from June through September; some European varieties are available through autumn.Figs grow on the Ficus tree (Ficus carica), which is a member of the Mulberry family. They are unique in that they have an opening, called the ostiole or eye, which is not connected to the tree, but which helps the fruit's development by increasing its communication with the environment. Figs range dramatically in color and subtly in texture depending upon the variety. The majority of figs are dried, either by exposure to sunlight or through an artificial process, creating a sweet and nutritious dried fruit that can be enjoyed throughout the year.